1:24 DAF XF105 Smoky Jr. This road haulage tractor by DAF is a restyled version of the successful previous series. Offering excellent reliability and a good standard of comfort on long-haul routes, the XF105 also features very good mechanical reliability and outstanding tengine performance under a wide range of conditions, in full compliance with the strictest environmental standards. Also, in the event of an accident, the cab provides the driver with an extremely high level of protection. The name “Smoky” comes from the race horse owned by the driver father (from here “Junior”) which, used to winning, during the race was disappearing like a puff of smoke in front of his opponents. 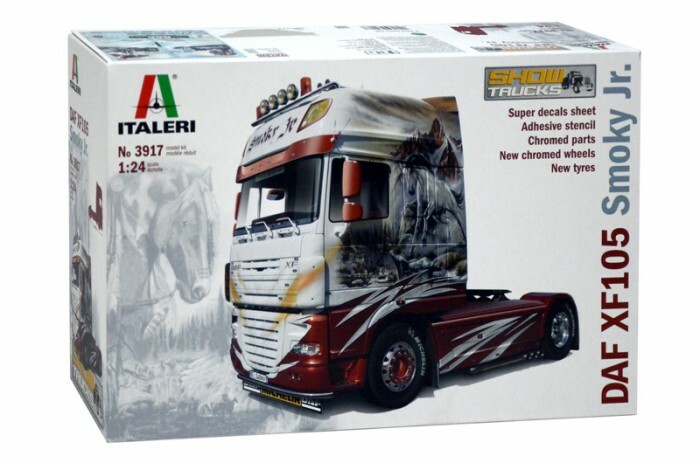 In a Wild West atmosphere, the horses are the protagonists in the airbrushed sides of his DAF XF 105 too. 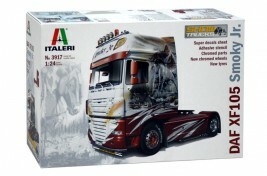 Dotaz na produkt: 1:24 DAF XF105 Smoky Jr.